That's all for today. We'll be back at 14:30 BST on Sunday with all the build-up to the race, which starts at 16:10 BST (remember the clocks go forward an hour tonight). Thanks for joining us and for all your comments. See you all tomorrow. Can Charles Leclerc convert his pole position into a win? Join us tomorrow and we'll find out. Ferrari's Charles Leclerc beat team-mate Sebastian Vettel to take his maiden pole position at the Bahrain Grand Prix. The Monegasque, 21, beat the four-time world champion by 0.294 seconds as Lewis Hamilton and Valtteri Bottas took third and fourth for Mercedes. Leclerc was fastest in all three parts of qualifying, a powerful statement of intent. Hamilton was 0.324secs behind, pipping Bottas by just 0.66s. Leclerc said: "I am truly happy. In the last race I was not satisfied with my qualifying and I worked really hard to do better. Vettel, who had only one run in final qualifying, said: "In the end, Charles did a very good job today and he deserves to be on pole. I felt happy with my only run and we are in a good place for the race." George Russell will line-up 19th on the grid for the race tomorrow. Miranda Lane: Whoop! Whoop! Sensational first pole position for Charles Leclerc. Well done!!! Ferrari front row lock out! Awesome for Lando Norris to be in top 10 as well. Niamh Lewis: Yes Charlie boyyy!! Sebastian Vettel is the youngest man to ever get on pole position as he was 21 years, two months and 11 days old when he took pole at the 2008 Italian Grand Prix. The first of many, surely. Max Verstappen, who qualified fifth, says, "Expectations were a bit mixed going in, it was definitely not the most ideal set-up we could have in qualifying. We could not switch on the soft tyre all weekend." Pierre Gasly will start way down in 13th and says, "The beginning of the weekend we struggled with the rear of the car and we struggled to really get the grip from the rear axle, there is potential but maybe this weekend I didn't take the right direction and we will be hoping to improve it." Mercedes team principal Toto Wolff says, "I think it is what we expected after the free practice, it is a bit disappointing because there is a gap and we will see where that comes from. "On long runs we were doing OK but we are lacking in straight line speed and that is not great for a race." Ash: Could Leclerc be the beginning of a new era at Ferrari? Let’s wait and see. Josh Earl: Ferrari would be extremely silly to favour Vettel over Leclerc. Said it when he was first announced as their new driver and I'll say it again, on a level playing ground Leclerc outperforms Seb. Jeremiah: Vettel has competition to deal with from within his team in the name of Leclerc and the two Mercedes. Gonna be an interesting season for him. Dennis: Looks like Ferrari is back to the Barcelona form. Not looking good for Mercedes and Lewis... Let's see what the race brings. Bishnu: My money is on Leclerc to win tomorrow. It's so impressive from Charles Leclerc, but not unexpected. He won GP3 and then Formula 2 at a canter, got promoted to Formula 1 and developed so well with Sauber in the midfield. 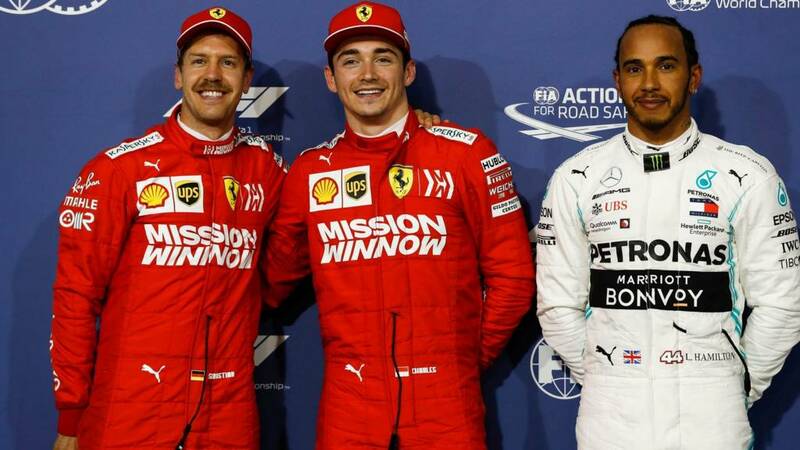 He then replaced former world champion Kimi Raikkonen at Ferrari and has taken pole position ahead of Sebastian Vettel by three tenths - it's such a good display. For Lewis Hamilton it was only a couple of hundredths from Sebastian Vettel so that will be a big target for him. From the second row, Mercedes can definitely do it, the difference in times is not as big as it was earlier in the week. Some more quotes from pole sitter Charles Leclerc, who says: "I'm extremely happy, in the last race I was not happy with qualifying and I did some mistakes in Q3 so I worked hard not to make the same mistakes again, extremely happy. "Sebastian is an amazing driver and I have learned a lot, and I will learn all year, but today I'm very happy to be in front of him." Lewis Hamilton, who starts third on Sunday, after finishing +0.324 behind pole sitter Charles Leclerc, says: "I really enjoyed qualifying and great to see the progression for us over the weekend. The Ferraris were very quick and congratulations to Charles. "Tomorrow is the important day and we will give them a great fight. We are going to work at it and keep our heads down and see what happens." Sebastian Vettel, who starts second tomorrow, says: "Maybe I was a bit shy in the second sector, Charles did a very good job today and deserves to be on pole, it puts us in a great place for tomorrow. The main thing is we got the job done."